Aug. 7, 2015, 2:43 p.m.
By Shan Wang @shansquared Aug. 7, 2015, 2:43 p.m. If you weren’t satisfied simply watching the spectacle that was the first Republican presidential debate last night (debates, if you count the “kiddie table” event for low-polling candidates), you might have relied on one of the many liveblogs out there seeking to recreate the noisy atmosphere in Cleveland, fact check candidates’ claims, and offer up context and background for a stunningly large field. To speed up its blogging process, The New York Times experimented with publishing posts from political reporters Maggie Haberman and Nicholas Confessore to its liveblog directly from Slack (the all-purpose team messaging app/virtual water cooler/meeting room). The chrome plug-in, built by San Francisco-based Times developer Michael Strickland, allowed reporters to write posts in an internal Slack channel. Deputy Washington bureau editor Paul Volpe then edited those posts in the same channel before they were exported to a second Slack channel that published straight to the liveblog. (Slack already allows users to edit their own messages after sending them, but the Times needed that feature customized so that moderators could edit other people’s posts.) Writing directly in Slack allowed Haberman and Confessore to have an organic conversation in real-time at “chat speed,” without having to worry about how their text would look on the Times website and without back and forth between various browser tabs and applications. “We’ve done it before, but in a Stone Age way, for other live events, with the reporter typing into Gchat, then an editor copying and pasting that text,” Marc Lavallee, editor of interactive news, told me. “It looks the same after-the-fact, but we were minutes behind on events.” Being minutes behind in a liveblog intended to be a “second screen” is not a good thing, and publishing chats directly from Slack cuts that lag down to seconds. The Times liveblog was already pulling in content from different feeds — photos, videos, charts, pull quotes, and more, all designed for sharing on social and optimized for mobile — so on the front end the Slack messages just constituted another feed. The Times uses WordPress to power the more “traditional” elements of the liveblog, such as some of these longer contextual posts. According to Times spokesperson Danielle Rhoades-Ha, last night’s liveblog “definitely had one of the largest liveblog audiences ever for NYTimes.com,” though she couldn’t comment on traffic specifics. Other desks at the Times are now excited to try out the Slack plug-in. 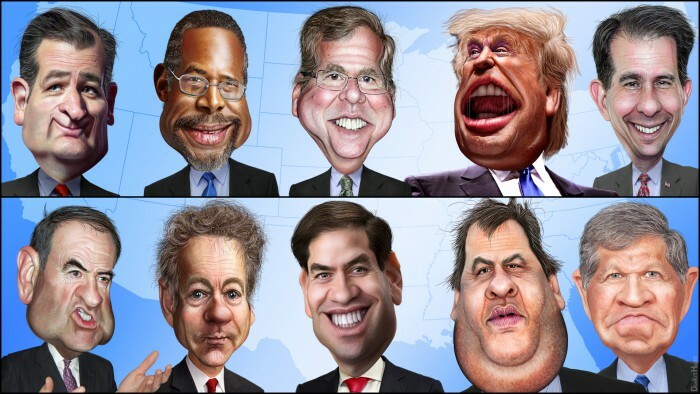 Photo of FOX News Debate Cast: The Top Ten by DonkeyHotey used under a Creative Commons license. POSTED Aug. 7, 2015, 2:43 p.m.
Wang, Shan. "The New York Times liveblogged last night’s GOP debate directly from Slack." Nieman Journalism Lab. Nieman Foundation for Journalism at Harvard, 7 Aug. 2015. Web. 20 Apr. 2019. Wang, Shan. "The New York Times liveblogged last night’s GOP debate directly from Slack." Nieman Journalism Lab. Last modified August 7, 2015. 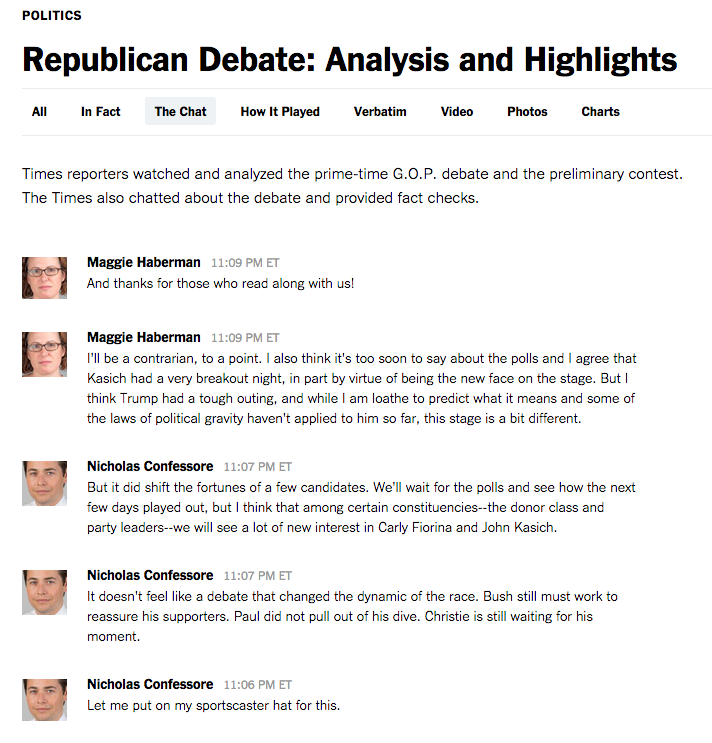 Accessed April 20, 2019. https://www.niemanlab.org/2015/08/the-new-york-times-live-blogged-last-nights-gop-debate-directly-from-slack/.